This is a FREE event for kids aged 12 and under. There are thousands of eggs and tons of prizes! Call (865) 429-7373 for more information. 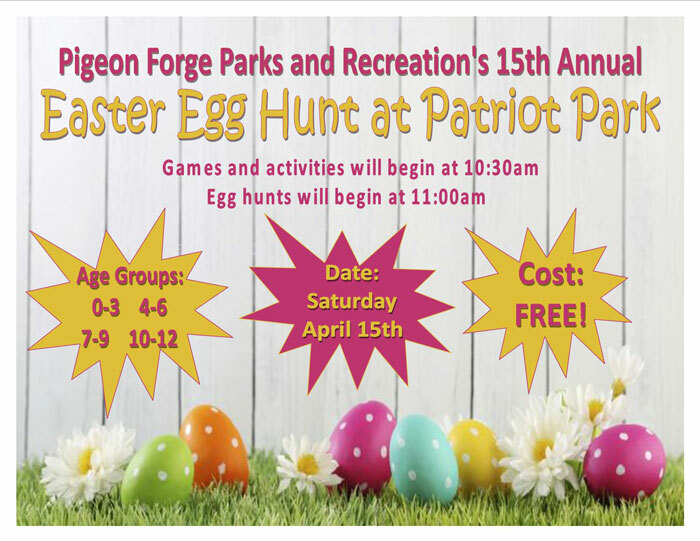 And remember that all the trolleys in Pigeon Forge call at Patriot Park, so this may be a fun way to show up with the family, or to move on after the fun. Next to Patriot Park is The Old Mill Pottery House Café & Grille, a great place to eat at all times, and very popular for the Easter Breakfast or Brunch with the Easter Bunny. Seating for this annual event is often sold out, and books from as early as March – so be warned, but call (865) 453-6002 for more information. All of the above is on Saturday, April 15, but on the Sunday two more great events occur. 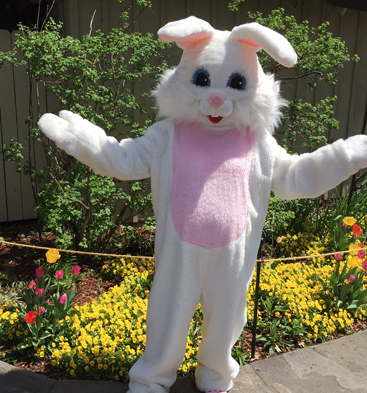 For the kids, it’s another chance to meet the Easter Bunny, this time at The Incredible Christmas Place. This is the region’s biggest go-to place for all things related to that special December event, but they also know how to pay service to Easter, and how to enchant kids. The Christmas Place is at 2470 Parkway in Pigeon Forge, and the Bunny is around during the day, so call (800) 445-3396 for more information. Meanwhile up-slope from Gatlinburg, the ski resort and year-round fun place Ober Gatlinburg offers its annual service for worship as the sun rises on Sunday, April 16 2017. This is a special time, and several hundred people usually make the journey up the mountain. Ober Gatlinburg makes it simple with its Aerial Tramway, leaving from downtown Gatlinburg every 15 minutes from 5:00 am. for the service scheduled at 6:30 am. The tramway is free both ways for this morning event. And parking is free also for those who choose to drive the 3-mile road up to the ski area. The offering on this day will be shepherded by the Gatlinburg Ministerial Association and given to the needy. After the service, a breakfast buffet is available at the Seasons of Ober Restaurant from 7:15 A.M. until 10:30 A.M. For more information see the Ober Gatlinburg Easter Sunrise website and call (865) 436-5423. These are the major events happening through the Easter weekend this year, but there are many smaller celebrations of Easter happening in both towns and the Smoky Mountains. And with so many chapels and churches in the area, you shouldn’t lack for a place to worship, or a place for Easter eggs!